Now the main question: Where is all of these facebook code coming from? While debugging further I found the culprit code of Facebook Like box Widget. I was using IFRAME code and then I switched to HTML5 code and this issue got resolved. Step 1) Get Facebook Likebox HTML5 code (section 1). Step 2) Put this code just before </body> tag. I’m using my own plugin “All in One Webmaster” to put this code in footer section. Step 3) Place the code for your plugin wherever you want the plugin to appear on your page (section 2). And you are all set. 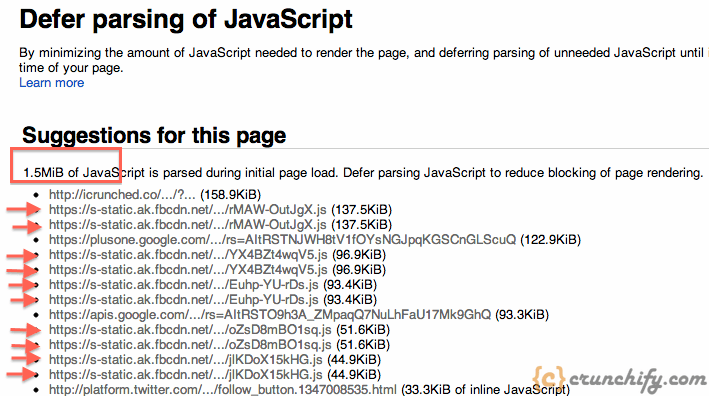 Now your page should load lot faster and your PageSpeed score should increase too. Hope this helps you fix loadtime issue.